Is your company blog is dormant? When was the last time you posted anything? Did you know your blog is your greatest marketing asset and can generate the best ROI? At O.C. Search we help companies make millions by helping them get the most out of their blogs. Pay-Per-Click Advertising is commonly referred to as “PPC”. 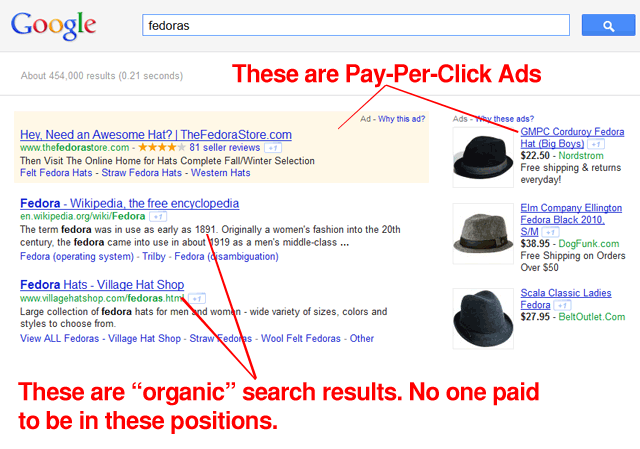 As it suggests, PPC means you pay for every time someone clicks on your advertisement. PPC advertising is commonly used by search engines like Google, Yahoo and Bing. It’s the ads you find outside the “organic” listings. For instance, on a Google search result page (as shown above), the ads at the top and to the right are paid for by businesses. The results to the left are “organic” listings. No company or person pays Google to be found on these organic listings. Should I Use Pay Per Click Advertising For My Business? We most certainly think you should, BUT you should be prepared before you jump right in. Pay-Per-Click advertising is the only true form of advertising where you can calculate your return on investment down to the penny. Because of online tracking tools like Google Analytics, Pay-Per-Click advertising removes most of the uncertainty when it comes to whether your advertising dollars are effective or not. You can track Pay-Per-Click ads that sent customers to your website and bought a product. From start (clicking on the ad) to finish (to checkout). You can track Pay-Per-Click ads that became Facebook Likes and newsletter sign ups. You can track Pay-Per-Click ads that turned into a customer phone call! However, we’ve seen many small business owners who are not ready for the dedication required to operate PPC campaigns on a day-to-day basis. BUT – with careful attention to detail, and a strong resolve, PPC can be a great way to boost up a small business. It seems to be that since it requires a bit of rigor and constant attention, a lot of “busy” business owners never attend to the focus that it requires. What Are The 3 Major Pay-Per-Click Advertising Networks? Google Adwords – By far, the largest Pay-Per-Click advertising network at this time is Google Adwords. It can be fairly expensive for small businesses, but all large businesses should be putting a portion of their marketing dollars into this network. Facebook Advertising – Facebook is quickly becoming a very popular advertising network. It’s a lot more different than Google Adwords. With Facebook you can target your ads to people of certain age groups, genders (male or female), likes and interests. Yahoo / Bing – This combined advertising network is very similar to Google Adwords. It tends to have a better return on investment, but smaller reach.